Yarra Glen is situated a little north of a flood plain through which the Yarra River flows. It has a substantial township which is 40 km north-east of central Melbourne. It was probably named after the Yarra Glen station, a grazing property of 12 sq miles. The open flood plain attracted early pastoralists. The Ryrie brothers overlanded stock from New South Wales, settling in the Yarra Glen district at Tarrawarra and Yering in 1836. European settlers moving out from Melbourne later reached the Yarra Valley from that direction, pushing beyond the Yarra Glen district to Healesville. Their route, known as the Yarra Track, passed through Yarra Flats, the early name for Yarra Glen. However, when bridges over the Yarra River were built the route along Whitehorse Road to Lilydale was more convenient than the Yarra Track over Christmas Hills and through flood-prone Yarra Glen, and traffic tended to avoid the area. Yarra Glen had a hotel, post office and primary school by 1870, and numerous surrounding holdings which ran stock or had vineyards for wine production (the Ryrie brothers had planted vines in 1838). The area was still known as Yarra Flats, and the settlement named Burgoyne, the name of the parish. With the construction of the railway from Lilydale to Healesville in 1888-89 the name Yarra Glen was given to the school, post office and the railway station. The railway line was built on wooden bridges nearly 2 km long, to raise it above the flood plain. The land around Yarra Glen was suitable for mixed agriculture. The decline of the Yarra Valley wine industry in the 1890s influenced the diversification of Yarra Glen into dairying and orcharding, as well as sheep and beef cattle. A horticultural and fruit growers' association was formed. The main change in the area's rural landscape was probably the consolidation of some holdings, as Yarra Glen's population did not rise above the 1911 census figure until after World War II. 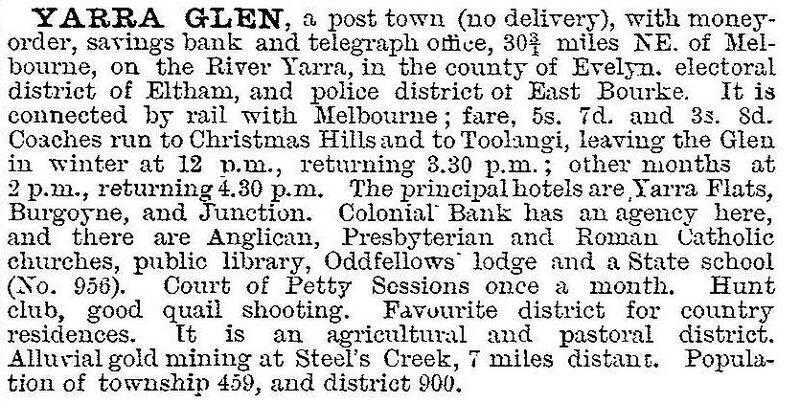 On 1 October 1958, the Yarra Glen part of Eltham shire was transferred to Healesville shire, acknowledging links that had existed since before the turn of the century. During the 1980s Yarra Glen township's residential population grew as it came within an acceptable commuting distance to work in metropolitan Melbourne. Commuting was by motor vehicle as the railway line had been closed in 1980 (later to be revived as the Yarra Valley tourist railway, and then disused). The township has a substantial shopping centre, a reserve with sports facilities, a well appointed racecourse and a showground. There are a number of historic buildings in its main street, the most prominent being the Grand Hotel (1888). East of the township is the heritage-listed Gulf Station, the most complete mid-nineteenth century farm buildings complex in vernacular timber construction, and Tarrawarra, a spacious country residence occupied by David Syme (1827-1908) and latterly by a Cistercian monks community. At least 13 people died when bushfire swept into the Yarra Glen-Steeles Creek area on Black Saturday 2009. Yarra Glen primary school had 137 pupils in 2014.